The mission of the Community Outreach and Ethics Core (COEC) at the Center for Exposures, Diseases, Genomics, and Environment (EDGE) is to foster bi-directional capacity building between Center researchers and a broad range of professional and public stakeholders, with a special emphasis on the ethical, legal, and social implications of genetics, epigenetics, and environmental exposures research. Our COEC has a focus on building capacity and facilitating collaborations through internal investments, external partnerships, and investing in the next generation of environmental health and ecogenetics researchers. The Center is focusing on cutting edge, dynamic areas of science (epigenetics, metabolomics, and nanotoxicology) and it is essential, now more than ever, to keep the public engaged in the promise and future of research. We believe our role is as catalyst and connector to meet the needs and interests of trainees, Environmental Health Science (EHS) and Clinical and Translational Science (CTS) researchers, and select community-based organizations and disease advocacy groups. 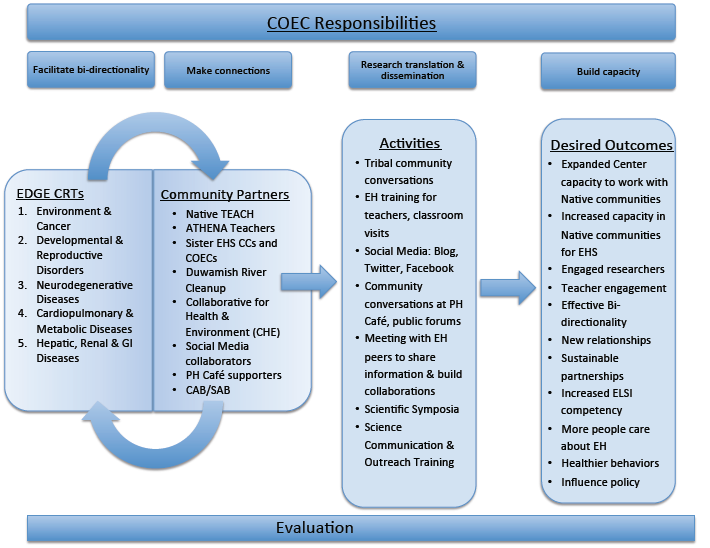 COEC Logic Model of interactions between Collaborative Research Teams (CRTs)and community partners driving activities and desired outcomes. To help guide our work, we have developed a logic model (click on the image above to open a full-sized PDF of the model). The model emphasizes that we are facilitators of knowledge exchange and dissemination. Our role is not to translate knowledge from Center investigators to our various stakeholders, but to open channels of communication that allow information, resources, stories, and goodwill to flow both ways. This model shows our dual role as providers of both outreach and capacity building services. There is as much room for capacity building within the Center as without; investigators need the support and knowledge that will encourage them to build lasting bridges to the communities impacted by their research, while communities need the skills and resources that help them conceptualize how research might be useful in context.